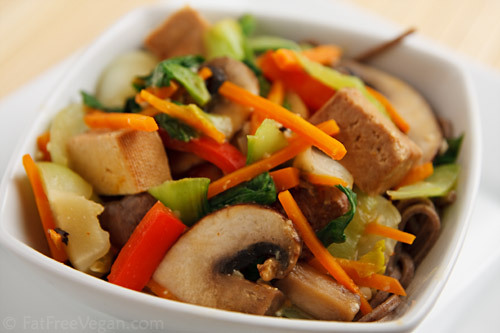 250g (8oz) firm tofu, cut into bite-sized pieces 2tbsp sesame oil 1head of chicory, halved lengthwise 4carrots, thinly sliced diagonally 5cm (2in) piece of fresh root ginger, peeled and grated 250g (8oz) shiitake mushrooms, sliced 8 spring onions, sliced into 2.5cm (1in) pieces 250g (8oz) bean sprouts 3tbsp toasted sesame seeds. 3tbsp soy sauce 3tbsp dry sherry 1 garlic clove, crushed salt and black pepper. 1- Make the marinade: in a bowl, combine the soy sauce, sherry, and garlic, and season with salt and pepper. Turn the tofu in the marinade, cover, and leave to marinate at room temperature for at least 15 minutes. 2- Drain the tofu, reserving the marinade. Heat the sesame and sunflower oils in a wok or large frying pan, add the tofu, and carefully stir-fry over a high heat for 2-3 minutes, being careful not to break up the tofu. Remove from the wok with a slotted spoon and drain on paper towels. 3- Separate the chicory halves into leaves. Add the carrots and ginger to the wok and stir-fry for about 2 minutes. Add the mushrooms and spring onions and stir-fry for a further 2 minutes, then add the bean sprouts and chicory leaves and stir-fry for 1 minute. 4- Return the tofu to the wok, pour the reserved marinade over the top, and boil quickly until almost all of the marinade has evaporated and the tofu has warmed through. Generously sprinkle with the toasted sesame seeds, taste for seasoning, and serve at once.